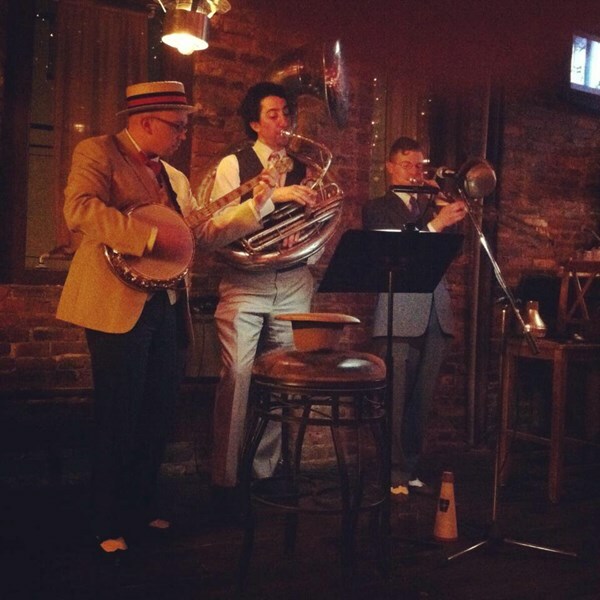 The Red Hot Ramblers are an authentic 1920s jazz ensemble in every way. They exemplify red hot syncopation, stompin' rhythms, and lyrical melodies associated with the Jazz Age. Their snappy on-stage appearance would make you think you stepped back in time to the Roaring 20s. From concert halls to dimly lit bars to swing dances to outdoor events/weddings, the Red Hot Ramblers have been pleasing audiences since 2012. 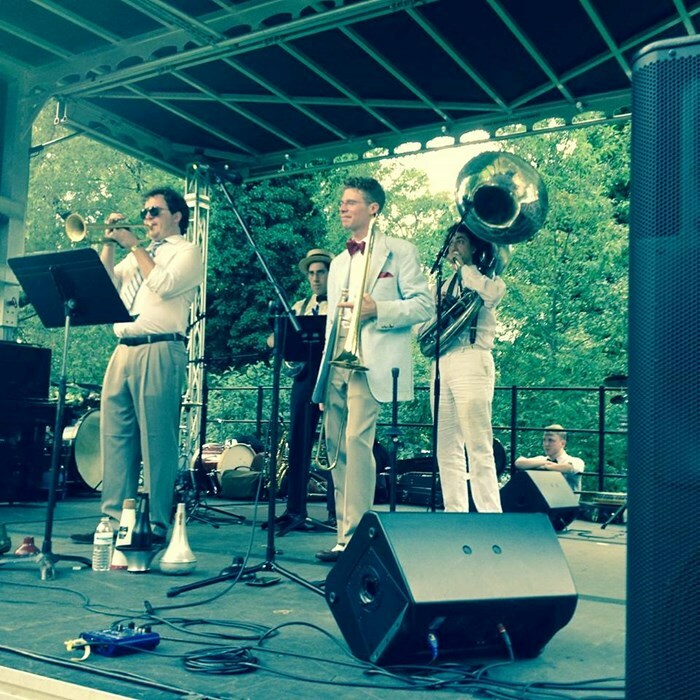 Our repertoire can extend before and after the 1920s from the early years in Jazz, such as New Orleans Dixieland and Ragtime, up to the swing era of the 1930s and 40s and even into the modern Second Line New Orleans parade style. 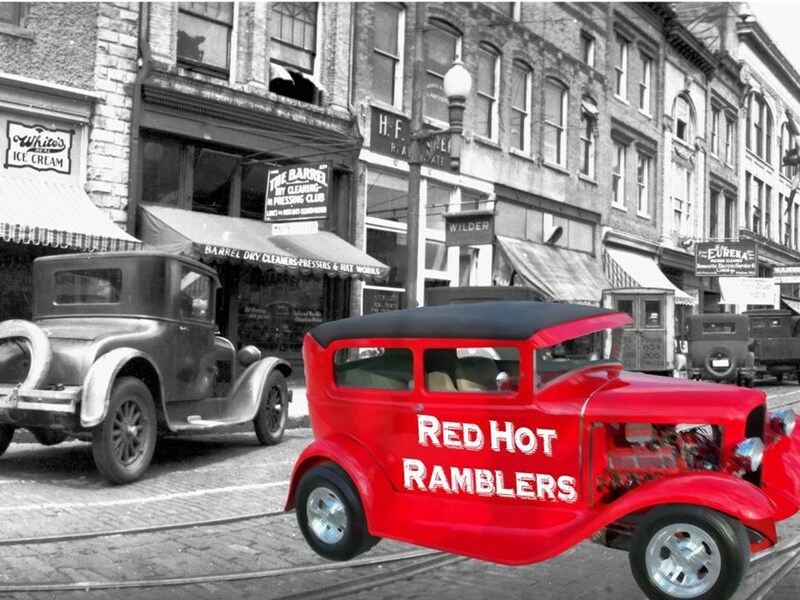 The Red Hot Ramblers are sure to put a smile on your face and a hop to your step! Larry was a pleasure to work with. He was responsive and flexible. They are a talented group that did a great job for our event. Would definitely recommend them. They were soooooooo good! People from other events in the building were coming by just to see where the great sound was coming from. I will be booking again. These guys were absolutely great! In spite of the rain they created an awesome atmosphere and everyone enjoyed them immensely. Would definitely recommend them and would hire them again in the future. We hired Red Hot Ramblers to play our wedding ceremony and cocktail hour. They were great! Talented musicians and professional. Larry was accommodating and easy to work with and they even learned a few of our favorite songs! Highly recommended! This is the second year we have engaged the Red Hot Ramblers for our church picnic. They are great musicians who perform the 20's jazz with skill and excellence. We love their selection of music and the inviting presentation. We had the Red Hot Ramblers play the cocktail hour at our wedding in June. The music was fantastic. They are all so nice and professional. Larry was also very easy to talk to and very accommodating of our needs during the planning stages. We had an emergency when our ceremony musicians could not make it in time for our ceremony. The Ramblers quickly stepped in and performed an entire ceremony with barely five minutes notice. Then, they ran to the cocktail hour and were set up and performing by the time the first guests walked in. Totally amazing guys! Cannot say enough nice things about both their music and the members themselves. We had the Red Hot Ramblers play at our "secret garden" wedding pre-ceremony and during cocktail hour. Larry was extremely flexible and generous with his time during the planning process - very responsive and accommodated every song request. I think the band ultimately had to coerce our guests to do the planned recessional through the gardens, so they went above and beyond. Thank you for bringing joy and magic to our party! These guys were great. Easy to work with, great communication. The music was fantastic, they were a hit at the fundraiser we had. I would highly recommend them. I don't usually give 5's so easily, but this band deserved it. They were incredible. We didn't have to worry about ANYTHING AT ALL. Which is obviously ideal on the day of your wedding. They started at the exact moment we wanted them to, and EVERY ONE raved about them. I was so happy to dance along through my own cocktail hour. Thank you so much guys!!! We will certainly keep you in mind for future events. Please note Red Hot Ramblers will also travel to Langhorne, Trevose, Bensalem, Bryn Athyn, Feasterville Trevose, Huntingdon Valley, Beverly, Croydon, Holland, Abington, Cheltenham, Jenkintown, Levittown, Riverside, Riverton, Bristol, Elkins Park, Hatboro, Palmyra, Richboro, Warminster, Willow Grove, Wyncote, Burlington, Glenside, Willingboro, Dresher, Fairless Hills, Horsham, Moorestown.